At the end of Q1 2012, much of the industry’s attention this year has been given to Hotspot 2.0, 802.11u, and the heterogeneous network (hetnet). As an industry, we’re watching (or will be watching) the unlicensed underdog take its rightful place as a mature, mission-critical technology for enterprises and carriers. If Wi-Fi is not already everywhere, give it 12 months. In the meantime, I want to give a pat on the back to our friends at Cisco for being the first WLAN vendor to release public code with Hotspot 2.0/802.11u support. Officially, WLC version 7.2 firmware includes it. Keep in mind that this is the first release, and the feature scope of this release is only a part of what we should expect in the next year. Hotspot 2.0 support by the WLAN infrastructure doesn’t mean much to end-users today because there are no (publicly available) clients, and the backend integration with carriers or other authentication paradigms hasn’t happened yet. Nonetheless, aside from other “will be available in the future” product announcements and plugfest trials, this is the first widely available hands-on exposure of 802.11u. 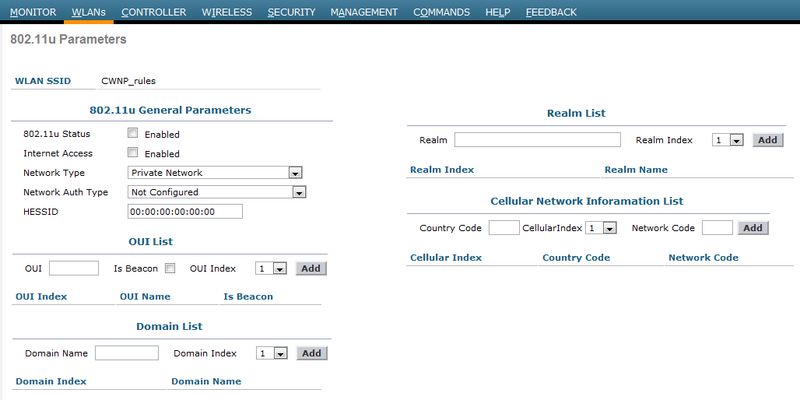 To ease my curiosity, I configured a simple 11u WLAN and sniffed a beacon. Not surprisingly, none of the most popular (AirMagnet, Wildpackets, Wireshark) analyzers could decode the 11u elements. In the packet details shown above, you’ll see the three consecutive 802.11u elements for which the element is not named and the ID values are still shown as “reserved” numbers. ID=107 is the 802.11u Interworking element. ID=108 is the 802.11u Advertisement Protocol element. ID=111 is the 802.11u Roaming Consortium element. WLAN infrastructure support for 802.11u is the inevitable first step toward transparent handovers. However, it’s only one piece in a multifaceted and complex ecosystem of “interworking.” We’re on the way to something useful, and Q2 will make that reality more clear. A tip of the hat to Cisco for pushing this boat off the dock.